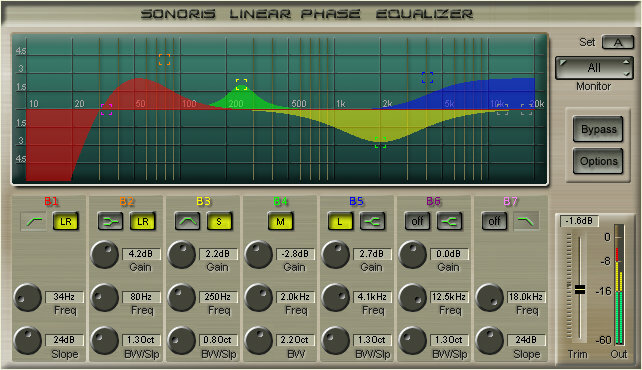 The Sonoris Equalizer is a parametric equalizer in VST and SAWStudio format. 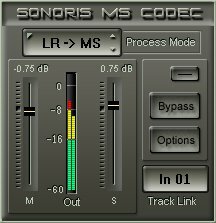 The plugin is suitable for mastering and mixing and features 7 bands, including lowpass, highpass, peaking and shelving filters. The plugin has a large graphical display that shows exactly what you get. 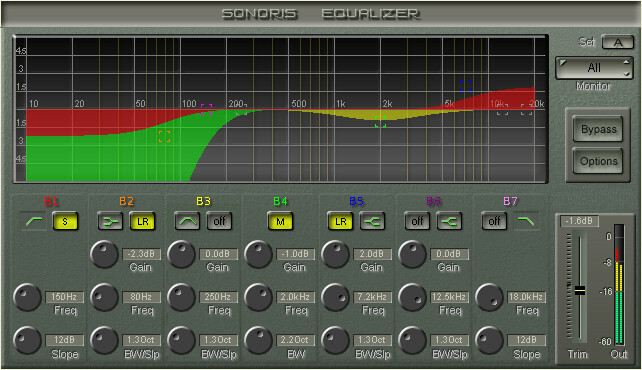 The Sonoris Equalizer has an automatic upsampling mode. In this mode, the Equalizer has an even more accurate response, especially at the higher frequencies. Every band can be set up to process stereo, L , R or (M)id and (S)ide channels. Processing the mid or side information can be very useful in certain situations. In mastering for example, it allows you to enhance a centered vocal while leaving the other instruments untouched. Or to center a bass without losing the stereo imaging of the rest. Adjustment of is made easy because the plugin allows for monitoring the LR or MS channels. The aim was to create a minimum phase equalizer with filters that match the response of their analog counterparts over the entire frequency range. The problem with your average equalizer. Most digital eq’s suffer from the so called pre-warping effect. This is an unwanted effect that occurs when translating an analog transfer function (the S-domain) mathematically to the digital domain (=z-domain). This is mostly done by a process called bi-linear transformation and as a side-effect, this process causes the gain to always be zero dB at Nyquist, independent of how you set the controls. This alone is not that bad, but the filters start behaving weird far below the Nyquist frequency, resulting in a distorted frequency response. How the Sonoris Equalizer solves it. There are two ways to avoid this effect: mathematically, by adjusting the transfer to have a prescribed gain at Nyquist or by using upsampling before the filter. In the Sonoris Equalizer, the first technique is used in the default mode and the second in HQ mode. Switching filters on and off is done with Soft Engage technology, that guarantee no pops and crackles. Soft Engage is a Sonoris proprietary technology. 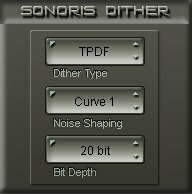 In the VST version the internal 64 bits signal is dithered to 32 bits. Some hosts, like Reaper and Cubase accept the newer VST 2.4 double floats standard and in those hosts the output is in 64 bits, undithered. Mit den beiden Equalizern sind Sonoris äußerst leistungsfähige und transparent klingende Präzisionswerkzeuge gelungen. ..a very substantially improved algorithm making this to my ear simply the BEST SOUNDING DIGITAL EQ I HAVE HEARD. Period. A very musical EQ that suits all my needs for mastering. Many excellent features and the sound is great!